The Disney California Food & Wine Festival expands to eight weeks in 2019, from March 1 through April 23. Over a dozen Festival Marketplaces will showcase foods and beverages inspired by California cuisine. In addition, Festival-inspired menus and menu items will be available at existing restaurants. This year’s Festival will include family-friendly seminars and culinary demonstrations, and live musical entertainment. There are also special ticketed events. Reservations are now open – visit https://www.showclix.com/events/28136 to purchase tickets. A celebrity chef prepares a signature dish live on the Palisades Stage. Begins with a buffet breakfast, including a sample of the chef’s dish. Following the demonstration, guests can pose for a photo with the chef. Events are held on Sundays from 11:00 a.m. to 1:00 p.m. $110/person plus tax and gratuities. 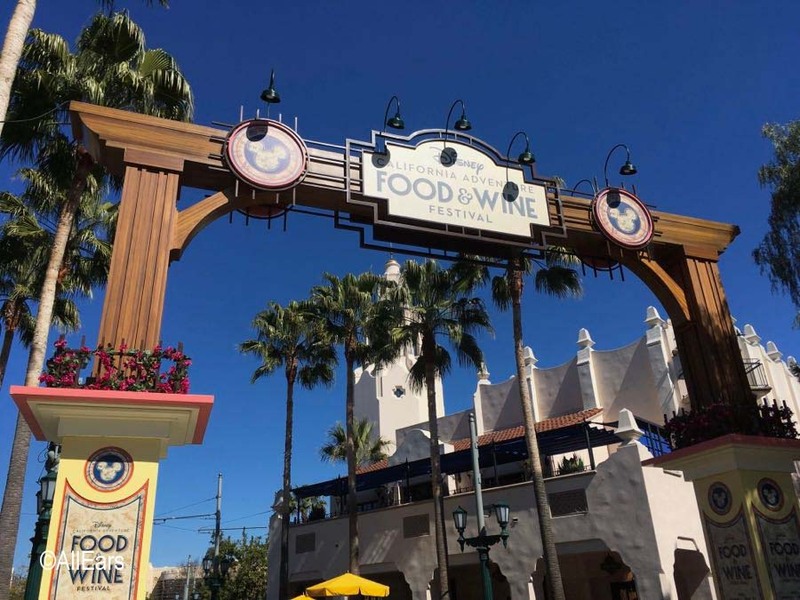 Guy Fieri at the 2019 Disney California Food & Wine Festival – Guy Fieri will demonstrate some of his favorite dishes during a 60-minute live presentation at the Palisades Stage. An after-party will be held at the Paradise Garden Grill featuring samples of some of the dishes prepared on stage. One complimentary cocktail or non-alcoholic beverage is included; additional beverages available for purchase. Saturday, March 9, 2019 from 6:00 p.m. to 8:00 p.m., $120/person plus tax and gratuities. Dinner with the Disney Chefs – a four-course meal prepared by three Disney chefs: Culinary Director Chef John State, Chef de Cuisine Jimmy Weita, and Executive Pastry Chef Jean-Marc Viallet, with beverage pairings by Disney Sommelier Jeannie Villarreal-Bissell. Dinner will be served in the Vineyard Room at the Golden Vine Winery. Following dinner, chefs will be available to sign copies of the new Disney Festivals Cookbook. A limited number of books will be available for purchase at the event. Thursday, March 28, 2019 from 6:30 p.m. to 9:00 p.m. $225/person plus tax and gratuities. Carthay Circle Winemaker Receptions – A evening of wines and hors-d’oeuvres, featuring guest winemakers. Takes place on select Fridays in the Carthay Circle Restaurant from 7:00 p.m. to 8:00 p.m. $99/person plus tax and gratuities. Guests must be at least 21 years old to attend. Wine, Beer, and Mixology Education & Tasting Seminars – Each 30-45-minute session will feature a visiting presenter and includes sample tastings. $20/person. Guests must be at least 21 years old to attend. Beer Education & Tasting will be held at Paradise Gardens Park each Friday-Sunday at 3:30 p.m. and 5:15 p.m.
Mixology Education & Tasting will take place in the Vineyard Room at the Golden Vine Winery each Friday-Sunday at 4:15 p.m. and 5:45 p.m.
Wine Education & Tasting will be held at the Sonoma Terrace each Thursday at 5:45 and each Friday-Sunday at 1:15 p.m. and 2:45 p.m. Complete schedule of participants, dates, and times below. Complimentary Events – The following events do not require a ticket to attend. Culinary Demonstrations take place at the Backlot Stage each Friday at 3:00 p.m. and Saturday and Sundays at 3:00 p.m., 4:15 p.m., and 5:30 p.m. Chefs will be preparing recipes and demonstrating culinary techniques. No samples will be served. Family-Friendly Seminars – 30-minute sessions featuring Chef Daniella Malfitano will be held at the Backlot Stage each Friday-Sunday at 3:00 p.m.
Jr. Chef – A hands-on culinary experience will be available for kids ages 3-11. Features an appearance by, and a little “help” from, Chef Goofy. Each child receives a wrapped treat at the end. The program takes place multiple times daily in the Hollywood Backlot. Friday 3:30 PM, Saturday 5:15 PM, Sunday 3:30 PM – Karl Strauss Brewing Co.
Friday 5:15 PM, Saturday 3:30 PM, Sunday 5:15 PM – Left Coast Brewing Co.
Friday 3:30 PM, Saturday 5:15 PM, Sunday 3:30 PM – Unsung Brewing Co.
Friday 5:15 PM, Saturday 3:30 PM, Sunday 5:15 PM – Karl Strauss Brewing Co.
Friday 3:30 PM, Saturday 5:15 PM, Sunday 3:30 PM – Anaheim Brewing Co.
Friday 3:30 PM, Saturday 5:15 PM, Sunday 3:30 PM – Stone Brewing Co.
Friday 5:15 PM, Saturday 3:30 PM, Sunday 5:15 PM – Smog City Brewing Co.
Friday 3:30 PM, Saturday 5:15 PM, Sunday 3:30 PM – Hangar 24 Brewing Co.
Friday 5:15 PM, Saturday 3:30 PM, Sunday 5:15 PM – Towne Park Brewing Co.
5:45 PM Disney Sommelier Series: Celebrating Bubbles!